It was high-tech encryption for an important period of time in the mid-1940s, so perhaps you can forgive us our obsession with the Enigma machine. But did you know that you can make your very own Enigma just using some cut out paper strips and a tube to wrap them around? Yeah, you probably did. But this one is historically accurate and looks good too! If you just want to understand how the machine worked, having a bunch of paper rolls in your hands is a very intuitive approach. Alan Turing explained the way it worked with paper models too, so there’s no shame there. With this model, you can either make the simple version with fixed rotor codes, or cut out some extra slip rings and go all out. We don’t find smartwatches to be supremely usable yet. This one sets a definition for usefulness. The Enigma machine is of course the cipher process used by the Germans during World War II. This Enigma Machine wristwatch is not only functional, but the appearance is modelled after that of the original machine. With the speckled gray/black case and the Enigma badge branding [Asciimation] has done a fine job of mimicking the original feel. Driving the machine is an Arduino Pro Mini. We’ve seen Arduino Enigma Machines in the past so it’s not surprising to see it again here. The user interface consists of an OLED display at 128×64 resolution, three buttons, with a charging port to the right and on/off switch on the left. The device is demonstrated after the break. Quite a bit of button presses are used to set up each of the three encoder wheels. But that’s hardly avoidable when you’re not committing to a full keyboard. We’re pretty impressed by the functionality of [Asciimation’s] interface considering it’s hardware simplicity. This seems perfect for kids that are proving to have an interest in engineering. They learn about ciphers, embedded programming, and mechanical design and crafting (this is a hand-sewn leather wristband). Of course if you build one and start wearing it into the office we won’t judge. Here’s something that’s just a design study, but [Ivan]’s Apple IIe phone is a work of art. You’re not fitting a CRT in there, but someone out there has a 3D printer, an old LCD, and a GSM module. Make it happen. See also: the Frog Design Apple phone. [Arduino Enigma] created a touchscreen Enigma machine. Why haven’t we seen an Arduino Colossus yet? The crew at Adafruit now have a Flying Toaster OLED, which means we now have flying toaster bitmaps for all your OLED/graphic display projects. [Ian] had an old rackmount programmable voltage standard. This was the remote programmable voltage standard, without front panel controls. No problem, just get an Arduino, shift register, and a few buttons. Video right here. A few months ago, [Jan] released a neat device that stuffs a modelling synth inside a MIDI plug. He’s selling them now, and we’d love to see a few videos of this. Thinking about starting a CNC machine, 3D printer, or laser cutter project? Misumi has you covered. They’re offering up $150 worth of free stuff with a coupon code. [CharlieX] is putting together a BuildLog laser cutter, a whole bunch of people on reddit are building 3D printers, and I have most of the rods for an i3 build. Just use the promotion code First150 on your order. Actually, read the terms and conditions, but rest assured – this is legit. A few months ago, we saw this Enigma cypher machine that combines the classic late-30s aesthetic of the original with modern hardware – including a few 16-segment displays. Now there’s a Kickstarter for the Open Source Enigma replica, and it looks like it’s going to end up being pretty popular. Here’s the site with all the deets. Check out that QWERTZ keyboard. [Jason] has a love of LEGO and a terrible keyboard. Combine the two and he came up with a functional LEGO keyboard. The electronics are, sadly, an old PS/2 membrane keyboard, but the mechanicals are a work of art – all the keys are mounted on a grid of Technic parts that can be positioned over each of the membrane buttons. Want a really cool look for your next enclosure? How about LED pipes? They’re those clear plastic bits that direct the light from LEDs around corners and can make any enclosure looks like a Star Trek set piece. You can cut these things with a laser cutter like the Alima team did with their indoor air quality meter. Looks pretty cool. This open-source Enigma replica by the folks at [ST-Geotronics] is simply stunning. They drew their inspiration from a hilarious build we saw a few years ago that hacked a children’s toy into an Enigma machine. Their project is instead modeled on the original Enigma M4 cipher machine, and aside from a bit of artistic license, we think they nailed the visual style. As for functionality, the guide claims everything works, right down to the plugboard. Rather than try to immediately cram everything into the final enclosure, the [ST-Geotronics] gang painstakingly worked out a prototype to be sure the four 16-segment LED displays had been wired correctly and functioned properly. The next step was laying out a swarm of buttons and resistors on a 6″x8″ perfboard. They used charlieplexing to handle the 16-segment displays (which actually have 17 LEDs each), and deceptively disguised each display as a nixie tube by mounting them vertically and encasing them in a transparent dome. The case follows the M4’s original dimensions and consists of a plywood box with scrap steel for the top plate. Swing by their Instructables page for more details. There you can find several Arduino sketches to test functionality and the code for five different M4 operation modes. [Scott Harden] is drilling teeth by day and designing radios that send secret messages by night. He’s set his sights on the Hellschreiber protocol which was used by the Germans in World War II along with their Enigma encryption system. The protocol is a viable alternative for transmitting and receiving code in environments with too much background noise for other communication systems. His goal was to develop his own transmitter using just one microcontroller. He picked an ATmega48 and coupled it with a 40 MHz crystal oscillator. [Scott] mentions that there is no other hardware necessary, but static messages stored in an array so you’d need some other hardware to push your own characters through via the chip’s UART or otherwise. The AVR sends messages by converting the data into audio using PWM. That signal is fed into the crystal oscillator, which produces an amplitude modulated signal (AM) that can then be transmitted. Check out his video after the break for a demonstration. 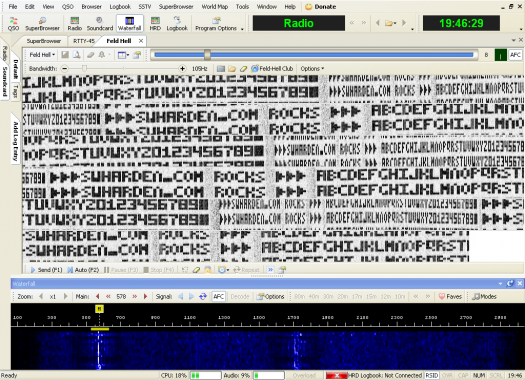 He’s decoding the transmitted data using a free program called Ham Radio Deluxe. Ah, the heady aroma of damp engineers! 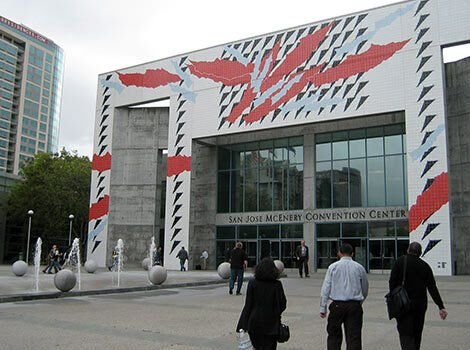 It’s raining in Silicon Valley, where the 2010 Embedded Systems Conference is getting off the ground at San Jose’s McEnery Convention Center.